I went to a most interesting meeting of the Big Data London group, at the new Google Campus, on 23 April 2012. 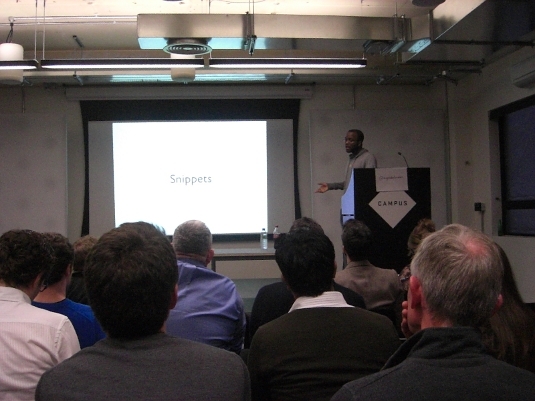 Ade Oshineye (pictured) gave an introduction to the knowledge graph [1.3MB PDF] (relevant links), with particular reference to schema.org. He also spoke of the historical move from the web of pages, to the web of data and now to the web of knowledge. Doug Cutting gave an introduction [844kB PDF] to the Avro data serialisation system. Tim Estes spoke on automating understanding of human data at scale [7.0MB PDF]. He argued against trying to map the world and in favour of human’s teaching computer systems, and said he took a Wittgenstein approach to his work. Big data is obviously a big subject! This was the first time I’ve attended this group, and intend to go to further meetings to explore this fascinating subject.